As a company that was founded in Japan in 1963 by Tsutomu Katoh and Tadashi Osanai, Korg has labored to build their brand to this day through a wide variety of professional and sustainable products. This year, they are celebrating their 50th anniversary. Korg has always been known as a manufacturer of great musical products, but as time has passed they’ve come to be known for producing some of the better digital pianos on the market. The Korg SP-250 is certainly one of those products. When you first come in contact with it, you might take it for granted just from the look of it. To be honest, it sort of looks like a simple keyboard. However, once you get the chance to put your hands on it, you’ll find it’s so much more than that. 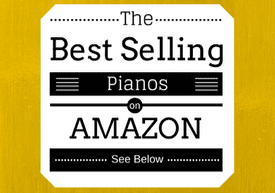 Enjoy our interactive guide below, where we compare the affordable Korg SP250 to other quality pianos based on price, weight, and even Amazon customer reviews. The SP-250 doesn’t fall far from the tree considering the line of pianos before it, namely the Korg SP170 and its brother the Korg 170s. It retains much of the simple, yet beautiful look, but adds a bit of flair. The jet black finish of the piano covers much of the outside, but now the two stereo speakers are connected to form one section that covers the upper portion of the piano. Interestingly enough, the speakers are the only customizable piece of the piano, coming in either black or a shaded grey. Just below the speakers is another deviation from the Korg 170 series, in a control panel with many more buttons and knobs. A nice touch of wood grain sits on either side of the control panel, giving the piano its own sense of distinctiveness. The 88 weighted keys of the piano nestle in beautifully just below the control panel, perfectly manufactured to mimic the expanse of a real grand piano. 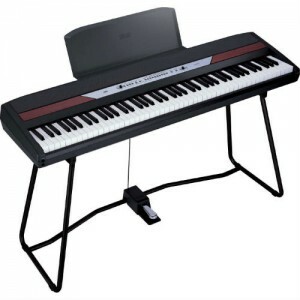 The SP-250 comes with a stand which can easily be assembled, and fits well with the overall construction of the piano. The stand is sturdy, and specifically constructed so that the crossbar is well enough out of the piano player’s way, and also recessed to accommodate the damper pedal which comes with the machine. The damper pedal smartly snaps on to the stand, and has a varying grade of sustain, as it is built to respond to half-pedaling. The keys of the Korg SP-250 play just like a real acoustic piano. This particular piano features Korg’s state-of-the-art mechanism for piano keys, called RH3. RH3 stands for Real Weighted Hammer Action 3, so it’s their tried and tested third generation of hammer action technology, and is now featured in all of their high-end pianos. To put it frankly, the feel of RH3 is simply amazing. As soon as you put your fingers to the keys you just might forget you’re playing a digital piano and not a real acoustic. 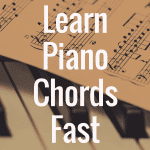 Each key is weighted perfectly, and the piano grades along the length of the piano, from bass to treble, with keys being heavier at the bass, and lighter at the treble. If that isn’t paying attention to precision, then I don’t know what is. Korg has even upgraded the tones for SP-250 to react better with the RH3 response system, so you will immediately see that the sampling for each note lasts significantly longer. 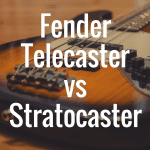 This makes the damper pedal work to perfection, as now you can get much more of a response not only at the beginning of a note, but all throughout. If you’ve been used to the 170 series, then you just might be blown away by the number of tones featured on the 250. The SP-250 comes with a collection of 30 sounds, 20 more than the Korg SP-170 and 25 more than the Casio CDP-120. Although far from a workstation, the piano player gets to work with many more options, now increasing the machine’s ability to be used in more performance environments. Added to that is the dual-layered function, which allows for two tones to be played at the same time. 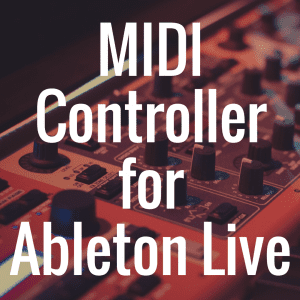 Any of the 30 sounds can be accessed from the control panel, which features a number of new additions. Volume knobs from previous pianos have been replaced with a master volume slider, while the reverb, chorus, and touch functions now have their own buttons. The touch function remains the same from other models, with a Light setting (a sensitive touch will still produce sound), a Normal setting (standard touch responsiveness of a piano), and a Heavy setting (loud notes are only produced with a hard touch). The transpose function also remains, allowing the player to change keys without changing hand placement. A new “bank” button rests on the control panel, and accesses any of the 30 tones by way of the corresponding sound buttons. 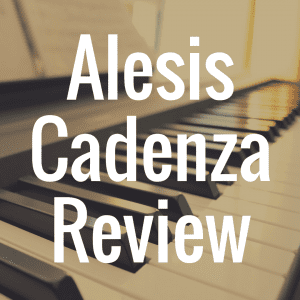 There are 6 concert and grand piano sounds, 6 varying electric piano styles, 3 jazz and church organs each, 2 clavichord sounds, 2 strings sections, 3 choir sounds, and even an acoustic guitar. In the rear panel of the Korg SP-250 there is damper pedal port, two all-important MIDI input/output connectors, and two separate audio output connectors, along with an AC/DC adapter connect port. The output connectors are a welcome sight, as previous models have had to depend on the headphone connectors to connect external amplifiers and digital recording equipment. There are two headphone ports on the front of the piano, a staple of many Korg digital pianos which allows two people to enjoy the piano simultaneously, whether to practice a duet or have a private piano lesson. The SP-250 is a wonderful piano to own, and many of the newer features it contains make it stand out a bit from some of its predecessors. However, it’s the same thing that makes it cost more than the others. Truthfully, it all depends on what an individual piano player is looking for. However, you should be able to avoid the $1200 retail price, and find this machine from anywhere around $500-$700. It’s a wonderful machine for that kind of deal, and with the high-end manufacturing on board this piece, any piano player shouldn’t be disappointed. 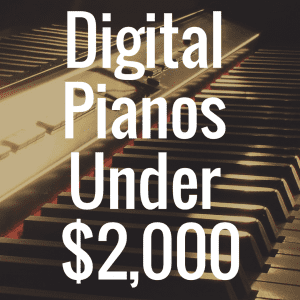 And for more on digital pianos, be sure to read our in-depth breakdown about them on https://www.digitalpianoreviewguide.com, as well as our additional reviews which are linked to the home page. 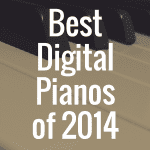 1) What’s the Best Korg Digital Piano?